In September 1715 John Erskine, Earl of Mar had proclaimed the exiled James Francis Edward Stuart as King starting the second Jacobite rebellion (the Fifteen). By November much of northern Scotland was in his control but, at the Battle of Sheriffmuir, he was intercepted by a smaller Government force and effectively defeated. The mid-seventeenth century had seen the British Isles engulfed in a series of internal conflicts now labelled as the Wars of Three Kingdoms. Religion was a significant factor with both Scottish and English factions strongly opposed to Catholicism or even any of its 'high church' principles being employed in Protestant ceremony. The wars had ended with the Restoration of Charles II in 1660 but, when he died without a legitimate heir, he was followed by his overtly Catholic brother, James VII (II of England). With both England and Scotland still war weary, the earlier conflicts had led to the death of a greater percentage of the populace than World War I would claim in the twentieth century, James was initially accepted. Those opposed to his Catholic leanings acknowledged that his only two children - Mary and Anne - were both married to Protestant husbands. However in June 1688 his wife, Queen Mary, gave birth to a male heir, James Francis Edward Stuart. Faced with an enduring Catholic dynasty, on 30 June 1688 a number of senior English magnates invited William, Prince of Orange to invade. He was the nephew of the King and was also married to his eldest daughter, Mary Stuart. William landed with his army on 5 November 1688 at Brixham which started a popular uprising against King James that resulted in his overthrow. Known as the Glorious Revolution, William and his wife became joint monarchs subject to constitutional limitations. However, whilst Protestant England embraced the new monarchs, reaction in Scotland was mixed. Although the Scottish Government supported William and Mary, amongst both Protestant and Catholic circles there was reluctance to displace the Stuart dynasty which had ruled Scotland for over 300 years. In April 1689 the first Jacobite rebellion commenced led by John Graham, Viscount Dundee. Supported by Irish troops and Highland Clans, both of which were pro-Catholic, he had military success at the Battle of Killiecrankie but was mortally wounded during the engagement. A number of further battles were fought but the uprising was ultimately defused when on 27 August 1691 the Government offered a general amnesty to any clans who had participated in the uprising provided they took an oath of allegiance to the new monarchs. The subsequent massacre of Glencoe in February 1692 did much harm to this attempted reconciliation. William died in 1702 (Mary had passed away in 1694) and was succeeded by Anne, another daughter of James VII. Her reign saw a number of new constitutional changes that further alienated the pro-Catholic Scottish Highlands. Firstly the Act of Settlement (1701) formally barred any Catholics from the throne. Secondly the Act of Union (1707) merged the Governments of England and Scotland. When Anne died in 1714, ending the Stuart dynasty, she was followed by the first of the Hanoverian monarchs, George I. Despite being descended from James VI, the new King was not popular in Scotland. On 6 September 1715 John Erskine, Earl of Mar proclaimed James Francis Edward Stuart as King commencing the second Jacobite rebellion (known as the 'Fifteen'). An initial response to defuse the rebellion - by granting any loyal tenants of Mar title to their land if they declared themselves loyal to George I - had limited success. The Earl was able to mobilise enough forces to capture Inverness, Aberdeen and Dundee and even mounted an (unsuccessful) attack on Edinburgh Castle. After just one month the Earl of Mar controlled all of northern Scotland. The most northerly remaining Hanoverian garrison was at Stirling Castle, on the southern banks of the River Forth, and in November 1715 Mar moved to dislodge them. However the Government had not been idle and a small army had been mustered by John Campbell, Duke of Argyll. Although significantly outnumbered by the Jacobites, he intercepted Mar at Sheriffmuir near Dunblane. 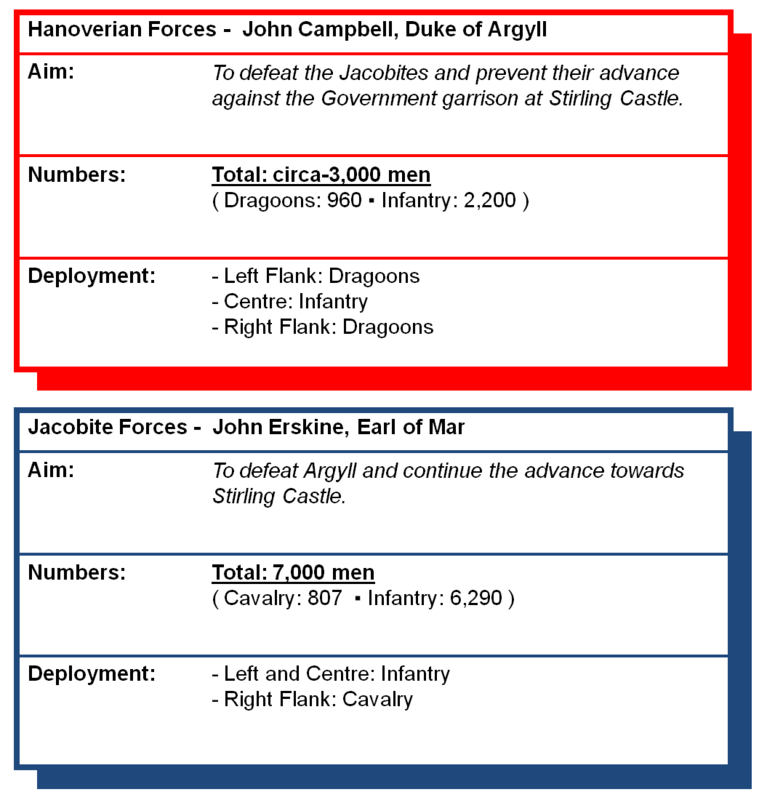 The Jacobite army, under the command of the Earl of Mar, was at least double the size of the Government forces. However the latter were well trained, better equipped and experienced soldiers. Furthermore their commander, the Earl of Argyll, was an experienced military man having served on the continent during the War of Spanish Succession including participation in the Battles of Ramillies (1706) and Malplaquet (1709). It should be noted that the Government army comprised both English and Scottish soldiers - in many cases the latter were the most opposed to the Highlanders, for in the eighteenth century there was a wide held prejudice they were backward and aggressive peoples. The Jacobites initially formed up in battle array on Kinbuck Muir, almost 2 miles north of the eventual battle site. 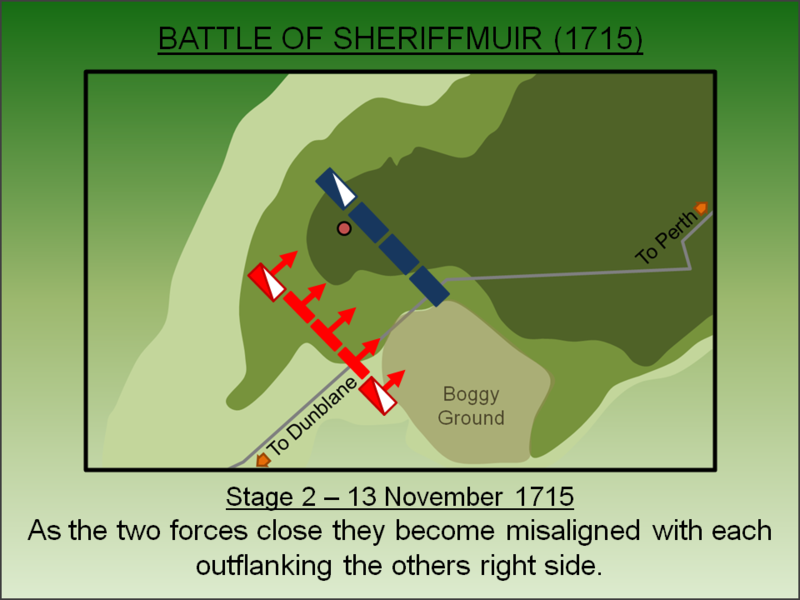 However, after seeing the Government army advance from Dunblane, they relocated to take the high ground of Sheriffmuir. There is dispute amongst authors as to the orientation of the two forces - some place then on a north/south axis, others on an east/west line. Given the terrain, the former seems the more probable although far from certain. 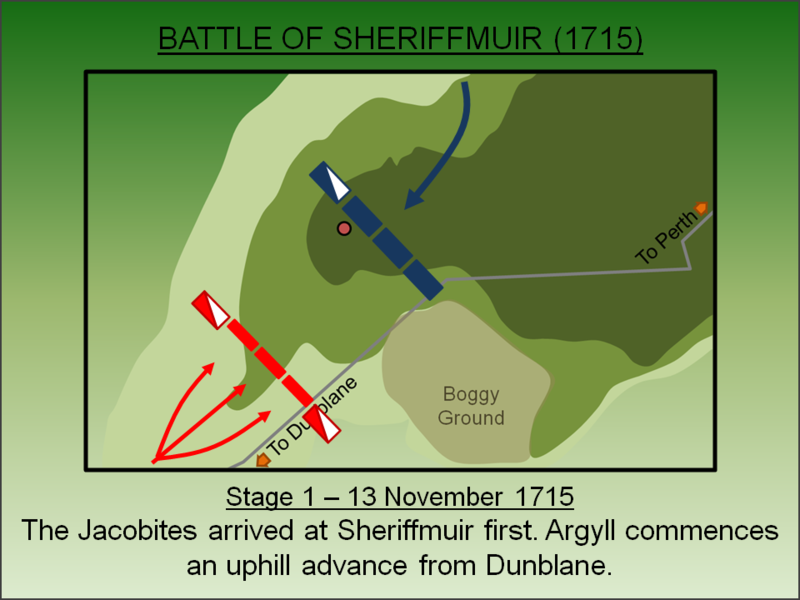 Despite the Jacobite relocation, which caused extensive disruption amongst their inexperienced ranks, they arrived at Sheriffmuir before Argyll had ascended the hill. With his left flank protected by marsh, Mar mustered his entire cavalry force on his right flank. As the two forces closed they became misaligned with each other's right wings outflanking the other. 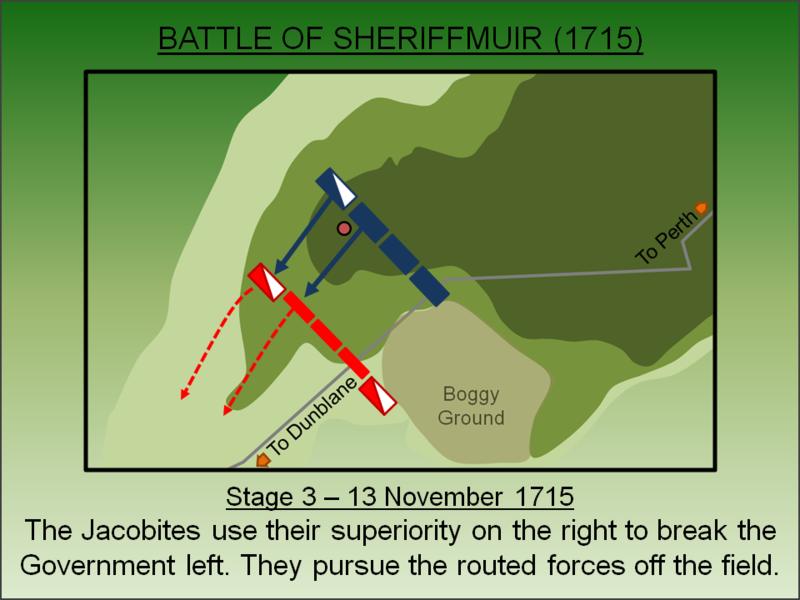 The Jacobites launched an attack against the Government left flank, seemingly before they were fully deployed, and broke them. The concentrated forces of the Jacobite cavalry pursued the defeated Government forces off the field. Had the inexperienced Jacobites turned on the exposed troops of the Government centre at this time, they would have won the battle. The Jacobites now launched an attack on the Government right flank. However, here the misalignment of the opposing forces gave Argyll the advantage and his troops repulsed the Jacobite assault. 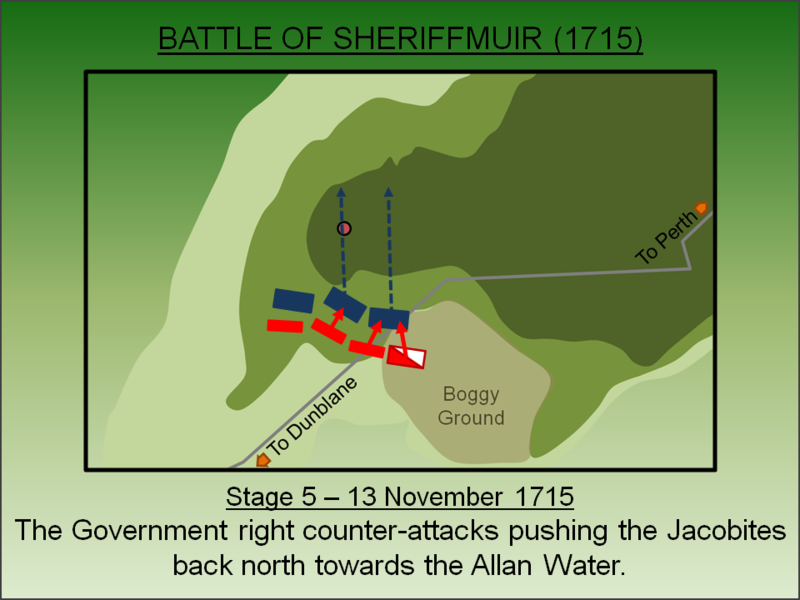 Having defeated the initial Jacobite attack, the Government right now pushed them back north towards the Allen Water. Combined with the action on the Government Right, the entire battle had now shifted 90 degrees from the starting positions. The Jacobite forces that had originally formed their right wing, slowly returned to the field and mustered on Kippendaive Hill ready for re-deployment. With his forces still substantially outnumbered, Argyll now drew up his men in nearby enclosures ready for a defensive action. The short Autumn day allowed one final Jacobite attack but it was a half-hearted affair and was easily repulsed by the Government troops. Dusk brought fighting to an end with both forces withdrawing; the Jacobites to Ardoch and the Government forces to Dunblane. The battle was indecisive with the Government army taking the bulk of the casualties - around 700 in total. The Jacobites fared better with around 250 killed or wounded. Given he had failed to defeat the Jacobites, Argyll must have had every expectation of fighting again the next day. However Mar's force ultimately withdrew to Perth leaving Argyll master of the field. The action at Sheriffmuir, along with an action at Preston in Lancashire (sometimes referred to as the Battle of Preston) and the capture of Inverness - all of which happened on the same day - defused the 1715 rebellion. The following month James Stuart himself arrived to take command of the Jacobites but his presence failed to restore momentum and he returned to France in early February 1716. Following the rebellion, the Government took measures to prevent a re-occurrence including passing the Disarming Act (1716) - which banned broadswords, muskets and other weapons for war being held by the Highland clans. To enforce the new measures a number of infantry barracks (at Bernera, Inversnaid, Kiliwhimen and Ruthven) were constructed with the intention of augmenting the main Governmental fortresses at Fort William, Fort George (formerly Inverness Castle) plus those at Edinburgh and Stirling castles. Later an extensive network of military roads, largely attributed to Generals Wade and Cope, were also built throughout Scotland. Despite these measures, further Jacobite rebellions would follow in 1719 and 1745/6. Battlefields Trust. Battlefield Report: Sheriffmuir (1715). Lancaster, J.H.D (2015). Sherifmuir: Battlefield visit notes and observations. CastlesFortsBattles.co.uk. Ordnance Survey (2015). Stirling. 1:1250. Southampton. There is a substantial monument (and smaller cairn) by the road-side. There is also a footpath (unpaved) to the Gathering Stone - allegedly the muster point for the Jacobites. Strong footwear is recommended and, if visiting at the same time of year as the battle (November), warm clothing! Obelisk. The monument was erected in 1915. Cairn. A small cairn is adjacent to the monument. Gathering Stone. Although now associated with the battle, the so-called Gathering Stone pre-dated the rebellion. Nevertheless legend now says this is where the banners and standards of the Jacobite Highlanders were flown. It was protected by an iron cage in 1840. Battlefield. The battlefield is undeveloped although the landscape has changed since the time of the battle. An unpaved path leads towards the Gathering Stone from the monument. Strong footwear is recommended! The monument is not sign-posted by is clearly visible on the single track unnamed road that runs through Sheriffmuir. There is a lay-by sufficient for a few cars in vicinity of the monument.